War correspondent Henri Malo Skinner is standing on the Hammersmith Bridge in London, watching a boat pass below on the Thames, when he sees a girl fall overboard. Without hesitation he runs down, jumps in, and pulls the girl to safety. Carrying her up onto the bridge, he puts her down and, exhausted, staggers out into the street where a vehicle hits him. He ends up in the Wellington Hospital in a coma. 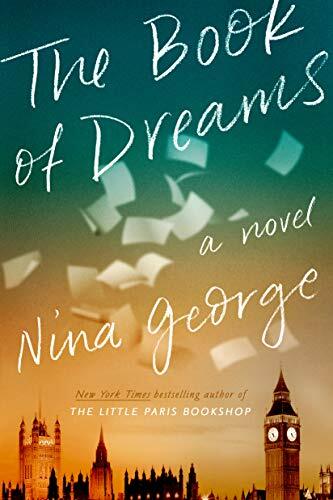 Originally published in 2016 in Germany as Das Traumbuch, The Book of Dreams is the latest novel by Nina George, best known for The Little Paris Bookshop, a New York Times bestseller, and The Little French Bistro. She’s also written mystery novels under the pseudonym Jean Bagnol. George tells her story through three alternating points of view: 13-year-old Sam Valentiner, Henri’s biological son; Edwina (Eddie) Tomlin, Henri’s former lover; and Henri himself. As Sam and Eddie visit Henri they become friends, and through their narratives we learn about Henri’s past. Meanwhile, we also experience the dream-like state in which Henri is stranded as his body struggles to heal and his mind tries to escape from the coma. He loops through memories involving Sam’s mother (Marie-France), Eddie, and his father, who drowned when he and Henri were caught in bad weather while fishing at sea. These are three remarkable characters that you will remember and think about long after you’ve finished The Book of Dreams. Perhaps the best drawn of the three is young Sam, who has an IQ of 144 and is a synesthete, someone whose brain tends to translate physical perceptions into colors. While hanging out at the hospital waiting to get into his father’s room one day he wanders up several floors and discovers Madelyn Zeidler, an 11-year-old girl who also lies in a coma after an accident that killed her family. Sam’s synesthesia is part of a larger sensitivity to the emotions and thoughts of others, and while he consistently senses the presence of his father close to the surface of consciousness, he becomes particularly absorbed in Madelyn’s situation. Because she is now alone in the world, hospital staff know almost nothing about Maddie that could be used to coax her back to awareness, and Sam makes it his mission to learn all he can about her. Eddie Tomlin is an interesting character who carries the spear for Nina George when it comes to writers and books. She’s the publisher of an imprint called RealityCrash, which specializes in speculative fiction, and her business is located in a tulip warehouse in London’s East End. Henri’s narratives provide the greatest challenge to readers, as they tend to be repetitive and to offer alternate outcomes for past memories. An analogy for Henri’s situation is suggested when Eddie describes to Sam a novel they have published called The House with a Thousand Doors, in which a man discovers a door in his office he’s never seen before. He steps through the door and finds himself back in his office, but in a different life. He steps through the next door to something different once again and quickly becomes lost in a maze of alternate realities. As we follow Henri’s coma dreams we see him struggling in the same way to return to reality. The novel is extremely easy to read, in part thanks to the translation by Simon Pare, which is flawless and transparent. As well, Jen Valero deserves mention for a very attractive book design for this edition. The Book of Dreams is a sensitive, insightful exploration of the emotional landscapes of George’s characters. It’s also a thought-provoking consideration of what it’s like to cross the shadowy topography between life and death, to watch the sun go down at the world’s end, and to follow loved ones as they navigate the alternate futures that lie ahead of them. As George explains in her Postscript, The Book of Dreams completes her cycle of novels about mortality. Now, she tells us, she feels emotionally free enough to begin a new cycle of novels devoted to life. After you’ve read this one and shared it with your friends and gone back to re-read passages you’ve bookmarked, you’re going to be more than ready to dive into her next work, whenever that may come our way.